Dr. S. P. Singh is Professor of Economics in the Department of Humanities and Social Sciences, Indian Institute of Technology Roorkee, India. In his long academic career of more than two decades, Dr. Singh has simultaneously been involved in teaching, research and administrative activities. 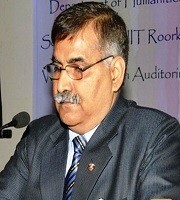 More than sixty research papers in referred national and international journals, three books, more than fifty research papers published in Conference proceedings and edited volumes along with seven units of course materials on ‘Agriculture’(prepared by IGNOU, New Delhi), and about two dozen articles in national level magazines such as Kurukshetra and Yojana are to his credit at present. Dr. Singh has guided nine Ph.D. theses and completed six major research projects. His research interests lie in the area of DEA based efficiency and productivity analysis, Rural Development, Development Economics, Agricultural Economics, Labour Economics, Irrigation and Water Resource Economics.